Ok thanks now it works. Whenever I try to use layer properties it doesn't do anything. Just use AdBlock available here for Chrome so it blocks the ads. 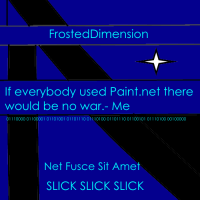 https://chrome.google.com/webstore/detail/adblock/gighmmpiobklfepjocnamgkkbiglidom And the Admins in the Forum are usually on so you can send them message and here is the Paint.net author and developer http://forums.getpaint.net/index.php?/user/44714-rick-brewster/ And you can directly install paint.net 4.0 http://forums.getpaint.net/index.php?/topic/27642-paintnet-40-alpha-build-5105-is-now-available/ the download says it on there. The Regular Version is here http://www.dotpdn.com/downloads/pdn.html and if you want to get the regular version from a different website you can get it here http://download.cnet.com/Paint-NET/3000-2192_4-10338146.html just click the green button that says CNET Secure Download. Hope this helps. Paint.net is the best Painting Program. Never mind I kicked some ad that lead to another download. But now I got AdBlock. And Paint.net is awesome thanks! I heard of paint.net so I decided to download it but when I do Bullguard Firewall prevents it. Is it a safe download? And if anyone else has Bullguard are you getting a firewall to?